As our regular readers know, we frequently pose a series of questions to a winemaker to probe their winemaking philosophy and to gain insight into how they became a winemaker. 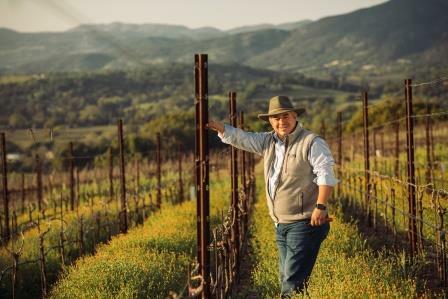 This week, we are featuring Rolando Herrera, the winemaker at Mi Sueño Winery. Rolando fell in love with wine after working harvest at Stag’s Leap Wine Cellars in the 1980s. He would stay there for ten years, learning and moving up, and then work with Paul Hobbs on several projects, before settling in 2004 into his current role. His winemaking philosophy, he says, matches the philosophy of his winemaking mentors: to focus on producing the best possible grapes, and then simply to translate those grapes into wine without doing too much. I was born in a small village, El Llano, in the state of Michoacán in Mexico. I got into wine in the summer of 1985 while working to build a rock wall on Warren Winiarski’s property, the owner of Stag’s Leap Wine Cellars. There he saw my work ethic and offered me a position to work harvest that year. Not knowing what harvest was nor having any idea what a winery was, I simply said, “Yes.” The first moment that I set foot into the cellars at Stag’s Leap I felt at home and entered a new world that I never experienced. Instantly I needed to learn everything about the business and knew it was what I wanted to do for the rest of my life. From 1985 to 1994, for 10 years I was at Stag’s Leap, 3 harvests as a cellar worker and 7 as a cellar master. From 1995 to 1997, I was an assistant winemaker at Chateau Potelle. In 1996 and 1997, I consulted for Paul Hobbs in South America (Chile and Argentina). Then from 1998 to 2000, I was the head winemaker for Vine Cliff. From 2001 to 2004, I was the Director of Winemaking for Paul Hobbs Winery and Paul Hobbs Consulting. In 2004, I branched out on my own to better attend to Mi Sueno Winery. Our vineyards are unique, since we own eight different parcels around Napa and Sonoma for a total of 40 acres. We are vintners that practice the good old traditional way; we work on our land, we are the farmers, growers, and the winemaker. We have 100% control, which is something that is becoming increasingly difficult for wineries that are our size. Respect Mother Nature, identify the pros and cons of the micro-climate, tending the vines and finding balance, learning to listen to the beauty of Mother Nature. I strive to become the best farmer in order to produce the highest quality level of grapes. That makes winemaking easy. At the end of the day my goal is to make wine that represents the terroir, the micro-climate, and the variety. There are always going to be hurdles to climb, but I think the biggest challenge is to make consistently great wines year after year. To do this I spend more time in our vineyards. Constant care and maintenance is what makes excellent grapes. Warren Winiarski, Paul Hobbs, and Marketta Fourmeaux are my favorites. I fell in love with their philosophy as I could relate with their winemaking and respect for the land. These winemakers had great influence on my career and how I came to find my own winemaking style. My son! I am so excited to see him become a winemaker and can’t wait to taste his wine. His passion and eagerness to grow in this industry brings me back to memories of working my first harvest. The Rhone region, especially Chateauneuf-du-Pape for the complexity of its terroir and the artistry of blending that happens there. St. Emilion and Pommerol in Bordeaux are also standout regions for the beauty of the merlot grapes grown there. A 1985 Cask 23 from Stag’s Leap. This is the wine that really got me to understand, love, and appreciate wine. The 1970 Petrus is also a standout. I have never tasted any other producer that makes merlot the way they do. The 1975 Cask 23 from Stag’s Leap Cellar is the oldest. Chateau Lafite Rothschild 1988 Magnum is the most expensive. Right now I have open a 2007 Mi Sueno Napa Valley Cabernet and the 2010 Selección Perla Herrera Chardonnay. If you had to pick one red and one white to drink for the next month with everydinner, what would you choose? For the red, Chateau de Beaucastel from Chateauneuf-du-Pape. As for white, Peter Michael’s Chardonnay La Carriere. When temperatures reach over a 100 degrees during harvest, beer is the best beverage at that moment, preferably ice cold and in a bottle. I really enjoy spending time with my wife and kids at home, grilling carne asada, and sharing a great meal with them. I am big fan of Prince and I am good dancer. I love the movie Pretty Woman and Forrest Gump. I think the most surprising thing is that I truly am a kid at heart. I love playing with my kids every chance I get. I am also genuine, kind, and nice. Sometimes my body language doesn’t reflect that aspect so much, however once people get to know me they see I have a softer, more approachable side. I would probably be an electronic engineer. I love manual and spiritual work. I would try to create some electronic devices or some type of software. Being happy. If you are not happy it’s not success. Happiness is the key to everything.